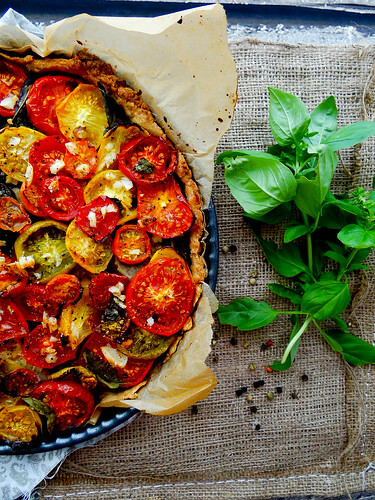 i won't lie - i love everything about this simple tart. 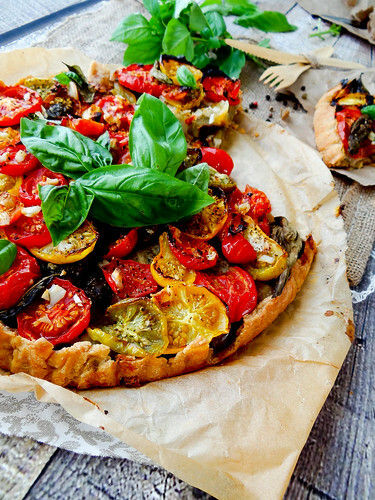 eggplant, heirloom tomatoes and basil along with a hearty dose of freshly cracked pepper make a satisfying and hearty tart with the taste of summer and the comforts of fall. 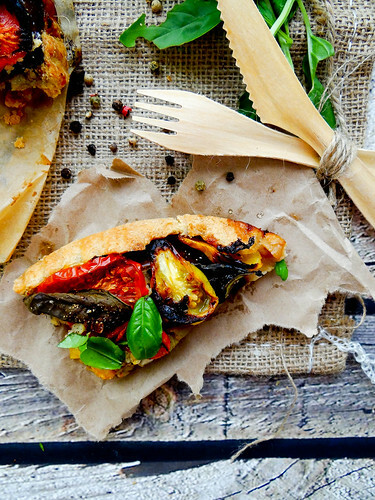 of course you really can't have eggplant & tomatoes without garlic can you? well at least i can't. i highly recommend making your own pie crust if you have the time. making your own pie crust may seem intimidating, but the more often you make your own the better and more comfortable you become with the process. trust me on this - making your own dough is really easy once you stop over analyzing and just go with how the dough feels and acts for you in the moment. okay this kinda makes me sound crazy, but read your pie dough, see where its at, add more flour if needed or water if needed- you will get the hang of it! once the eggplant and tomatoes are layered in the pan, garlic is sprinkled over the top along with a drizzle of olive oil and tons of freshly cracked pepper and flaky salt. Delicious served right from the oven or at room temp. this would be amazing served at an informal get together simply left out on a cutting board allowing guests to help themselves too throughout the night. are you a fan of eggplant? 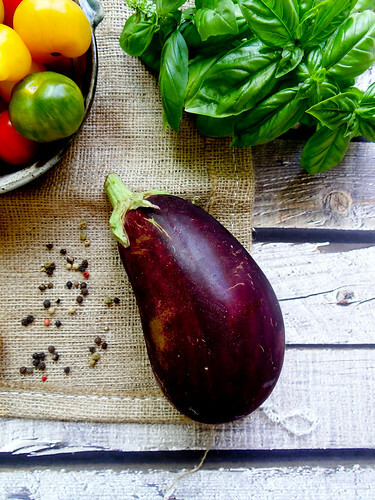 when you end up with a boatload of eggplants from your CSA or garden what do you create with them? this time of year do you start to crave the comforts of fall? remove pie crust from the fridge and press into the tart pan. 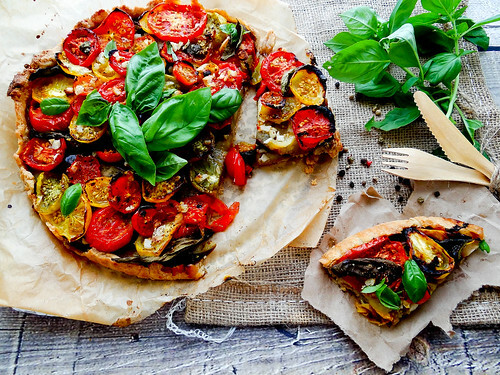 layer the bottom of the tart with the eggplant, then the tomatoes on top of the eggplant in any pattern that you wish, overlapping of the tomatoes is fine. sprinkle the garlic over the tomatoes. drizzle with olive oil and sprinkle with a good amount of flaky salt & freshly cracked pepper. bake in the pre heated oven at 425* for 20 minutes, reduce oven temp to 375* and continue baking for an additional 20 minutes. remove from oven and allow to cool. sprinkle with torn basil just before serving. this was really tasty at room temp or just out of the oven! The crust would be so easy to make gluten free by subbing in AP GF mix! Seriously they need to come up with that Techonolgy cause I just tried to do the same thing with your Cupcakes! sooooooo soooooo good.. The photos are awesome...Feel like having one piece! Whaaat!?! 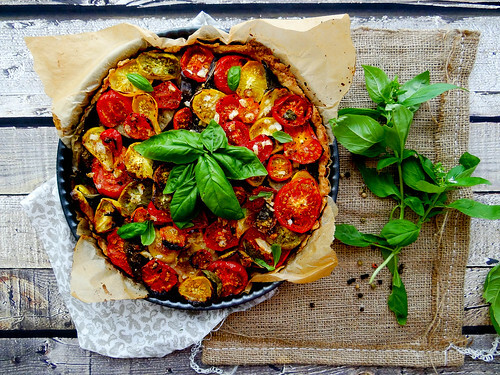 You of all peole do not have a tart pan - immediately leave right now, get a tart pan and make this! What a great transition dish! I like eggplant but rarely buy it- it's more something I enjoy when out. I would love to get to dig into something like this though. Send me one? ;) I'll pay you back in loads of virtual hugs! Oh how I wish I could hand deliver one of these too you! 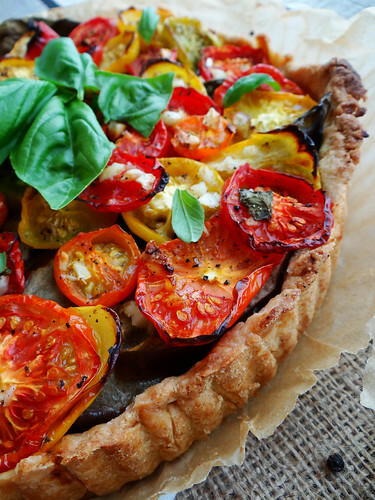 What a perfect use of all the late-summer tomato bounty! 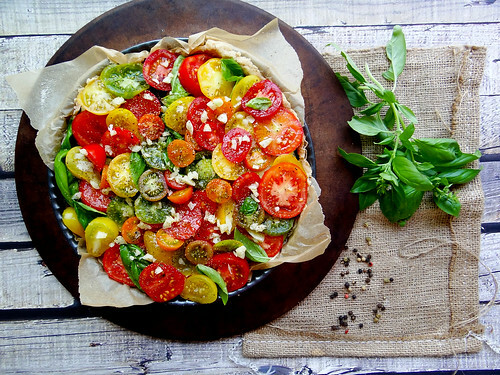 I love the beautiful range of colors in this tart. My gosh this tart looks incredible! I have got to make this before the tomatoes go away! You hit it right on Richa - the PERFECT way to hide Eggplant, and it is so pretty too! Thanks Uru! It was definitely a fresh tart that tasted so amazing! Beautiful!! I just got some heirloom tomatoes yesterday and they are one of nature's gifts to this world. :) So delicious, this recipe is making my mouth water! This is beautiful! 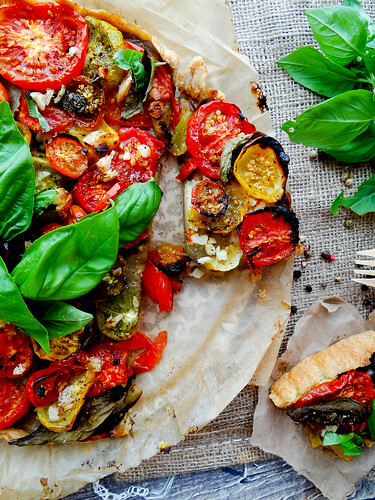 Love, love all those colorful tomatoes. This post makes me want to have this right now! Beautiful pictures! 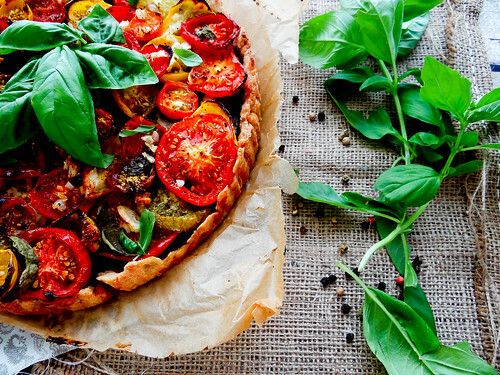 This tart looks delicious! I want this now. If I could I would totally send this over to you right now! Seriously, though- I don't know which is more gorgeous: the tart or these pictures of the tart. Incredible post, Heather! YES you need a tart pan! and YES I do need to be in the Kitchen with you making this and eating a S'more Cookie at the same time :) How do we make this happen ? I am a total grazer give me some wine and an open spread, good company and I am one happy girl! Yum - that looks like one jam-packed tart! I love that its filled up with so many tomatoes to really highlight the vegetables, instead of other filler ingredients like eggs or cheese. 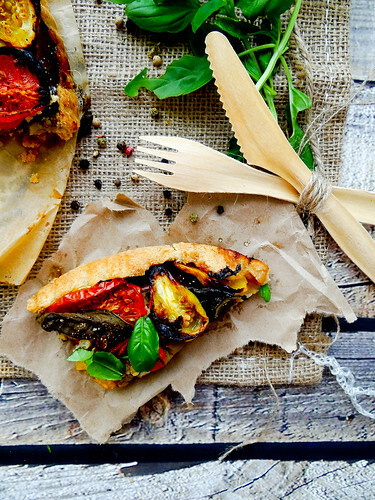 And I always think that I don't really like eggplant, but it sounds like the perfect compliment to the tomatoes in this recipe! To make it a bit easier on the waistline I made a pizza crust. I used a lot of different tomatoes just like you - large ones, small ones, red, yellow, green... It turned out absolutely delicious, juicy, pleasing to the eye. Wonderful! I am so excited you made this and liked it - what a great option for a Lighter version, love it! Thanks for letting me know that it was a sucess! This is soooo beautiful! 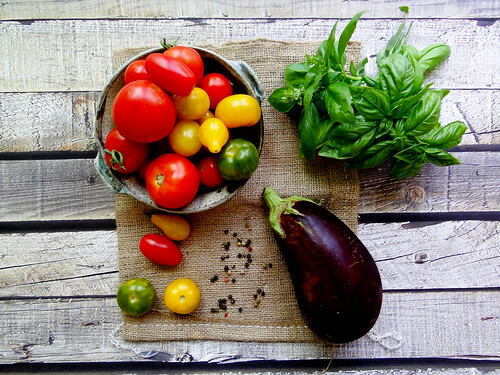 I love eggplant, tomato and garlic, too - with basil, of course! I had planned another dish to take to a gathering tomorrow, but I think I have to make this instead. I don't have a tart pan - hope a pie pan will be ok instead. Thank you! Thank you for stopping bye - let me know if you get a chance to make this and what you thought! This is so incredibly beautiful! And it looks like it tastes good, too :) Glad Foodbuzz featured you today so I could find you! I've been collecting loads of vegan recipies since I became a vegan 2 years ago and this must be my favourite. It's soooo delicious and really easy to make. Thank you for sharing it. I made this last night. I didn't have eggplant - my husband, unfortunately isn't a fan. :( So I subbed with some roasted broccoli. This was so easy to make & delicious! I'm looking forward to finishing it off for lunch today! Yay! That makes me so happy :) love the swap of eggplant with broccoli , so glad you let me know how it turned out!! This looks beautiful and delicious. But, just wondering, since those veggies have high water content, don't they make the crust underneath them kind of soggy? Or does prepping the eggplant dry it out enough to make it work?